SQUIRREL HILL was a punch in the gut for American Jews, the worst attack on us in American history. In its wake, Jewish communities across the country are asking ourselves: what is the actual threat of violence against us, and how do we protect ourselves? Progressive Jews are further asking: how do we protect our own people while building solidarity with other groups targeted by white Christian violence, like Muslim or black non-Jewish communities? Since the shooting, some of my friends and I have felt a visceral fear in our bodies that surprised us with its intensity. Many of us who are white and Jewish are experiencing two oscillating, contradictory reactions: the first, a feeling of shock at our vulnerability, the sudden precariousness of our sense of social safety; the second, a dreaded familiarity, the voices of Holocaust survivors insisting “you never know when it could happen again” drilled deep inside of us. Some members of our Jewish family who are multiply targeted—such as Jews of color, queer and trans Jews, and Jews with mental illness—are warning us that increasing police presence in our synagogues will alienate them and put them at risk. We need to figure out what an informed, coherent security strategy that takes these concerns into account looks like. Still, it’s tricky to make a blanket assessment of the current threat level of anti-Jewish violence based on these and similar incidents. According to a recent Forward article by Josh Nathan-Kazis, anti-Jewish hate crimes reported to the FBI did increase by 37% from 2016 to 2017, the first year of Trump’s presidency, but the vast majority were acts of vandalism, not physical violence. Nathan-Kazis points out, “only 7% were assaults . . . That’s a far different breakdown than for nearly every other group included in the FBI’s report . . . Thirty percent of anti-Muslim hate crimes, and half of hate crimes targeting gay men, were assaults in 2017.” We don’t know yet whether Squirrel Hill and the recent arrests of heavily armed neo-Nazis in Florida and DC represent a turning point towards increased physical violence against Jews in America, but it certainly appears possible. One reason it’s hard to make a general assessment is because the threat level varies greatly by geographic location and by community. Local white hate groups and individuals vary in level of organization, armedness, and violent intent across cities and regions. And whether they’re planning anti-Jewish violence or spontaneously enacting it, they tend to target instantly visible Jewish institutions or individuals, such as synagogues, JCCs, or Orthodox Jewish males (who dominate the image of the “Jew” in popular Jewish and non-Jewish imagination). This means that every Jewish community and individual must make their own threat assessment that takes into account these factors. The quality of our threat assessment is also corroded by other forms of bigotry, which frequently cause the Jewish community to turn on its own. Following the Squirrel Hill shootings, there have been multiple recent reports of white Jews and police questioning and attempting to exclude Jews of color, particularly black Jews, from synagogues. Most shockingly, on Thursday, Yehudah Webster, a black Jewish member of JFREJ (Jews for Racial and Economic Justice) posted an account of being physically chased down and surrounded by over 20 Hasidim in Brooklyn because they suspected him of stealing the Torah scroll he had been carrying down from his apartment to his taxi. In a time of heightened fear about anti-Jewish violence, racism is priming white Jews to be particularly vigilant against antisemitism from people of color—to the point of not realizing the person of color they are profiling might be a Jew—all the while distracting us from white Christian antisemitism. In an interview, Stefanie Fox, Deputy Director of JVP, said that JVP is exploring the possibility of starting an interfaith security coalition in which Jews, Muslims, Sikhs, and black Christians (as well as white atheist and Christian allies) band together to protect one another’s worship spaces. “If we’re doing the work to deepen our practice and skills around safety outside of policing, that capacity can and should serve not only our Jewish communities but also our interfaith partners in the crosshairs of white nationalist and state violence,” Fox explained to me. “We need to invest in being as prepared as possible, sending our people out there, or asking others to come protect us,” she added, suggesting that training might draw both on security expertise inside of Jewish communities as well as from Muslim, black or queer community organizations. JVP also hopes to provide its own trainings for members of the Jewish community, who in turn can help their synagogues develop effective safety plans that rely on the police as little as possible (Fox provided this link for people interested in contributing to this project). To get a sense of what such a training might actually look like, I spoke with Tur-Ha Ak, a black liberation leader with over 25 years of professional security expertise, whose security team, Community Ready Corps (CRC), provides security to mosques, synagogues, black churches, and progressive rallies in the San Francisco Bay Area. Ak emphasized to me the importance of “pre-assault indicators”: researching and identifying local white hate groups in order to monitor their activities, and to be able to quickly recognize if a member of a local hate group is walking up to a targeted space. If you know who your local white hate groups are and what they look like as individuals or as a group, or perhaps, if you’re monitoring some of their chat groups, you have a better chance of sussing out what’s coming ahead of time, or recognizing a threat more quickly as it’s approaching. Ak stressed that in the moment, an extra minute makes a big difference. In the case of an attack, Ak says that there’s no cure-all, but there are degrees of safety. Ballistic blankets, for communities that can afford them, might be a scary thing to buy, but they could save lives. So, too, could a strategic evacuation plan that maps out a potential route of attack and escape, installs locks on key doors, and identifies areas of concealment and cover. Such a plan could be designed by professional security experts, or failing that, by trained, lay individuals. On the issue of using police for added protection—a contentious point because of the clear risk it poses for Jews and non-Jews of color—Ak has mixed feelings. New York City policemen showed up at some New York City synagogues with assault rifles and flak jackets the week after Squirrel Hill, a highly visible, militarized presence that alarmed Jews of color, trans Jews, and members of other groups that are vulnerable to police violence. But, Ak says, the police were “prepared to meet the threat of someone using an assault rifle.” He acknowledged that the police make many types of situations worse, but was not prepared to dismiss their utility out-of-hand, because of their ability to deter or fend off an attempted or in-progress armed attack. Jewish communities will have to make some difficult decisions when evaluating if or when to use the police or armed security. 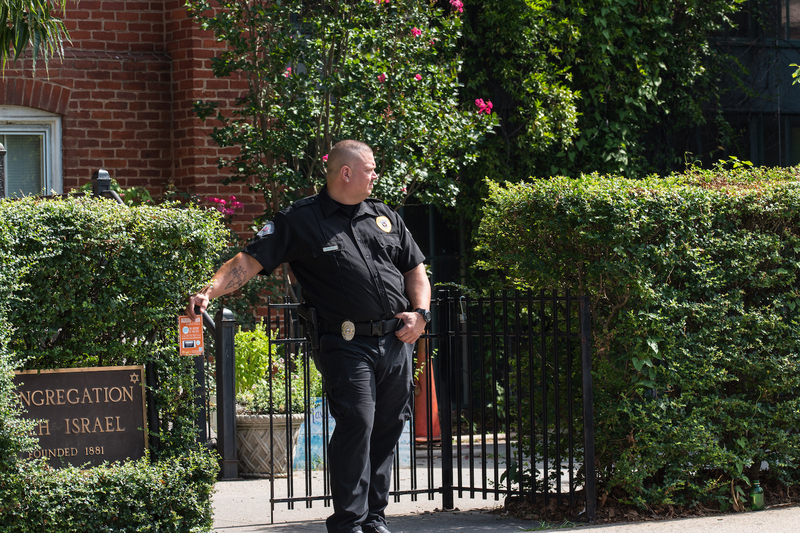 One model that JVP pointed to was the synagogue security plan developed by Congregation Kol Tzedek of Philadelphia, which emphasizes only calling the police as a last resort if their lay-led safety team is unsuccessful in de-escalating an active threat.